Real simple tale to tell you guys- over the past 8 years Jeff Eats and Mrs. Jeff Eats have seen Delray Beach resident- national touring headlining “clean” comedian Peter Fogel’s stand-up act something like 13 times and each and every time he absolutely killed! Just announced, Peter Fogel at the Boca Black Box on Thursday, May 24, 2017 at 8pm. Trust Jeff Eats on this one, you want to see Peter Fogel’s show! The touring star of My Mother’s Italian, My Father’s Jewish, and I’m in Therapy! Appearing at the Boca Black Box this May. Peter J. Fogel is one of America’s funniest comedians that you’ve never heard of… but have seen countless times on television. 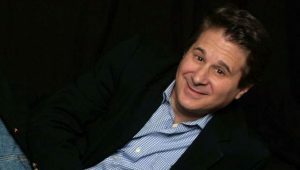 From comedy clubs, to cruise ships and Las Vegas theaters, he’s opened for such stars as Rita Rudner, Jimmy “J.J” Walker and Robert Wuhl (HBO’s Arliss). He’s shared the stage or has worked with Jason Bateman, Ed Asner, Shirley Jones, Robin Williams, Harry Anderson, Ray Romano, and Jon Stewart. Peter’s also written for such stars as Academy Award nominee Chazz Palminteri (A Bronx Tale, Bullets Over Broadway.) This is a show you won’t want to miss! Our Country Club had him a a couple of years ago and he was very funny. Fogel is a very fast witted clean clever comedian. For those who haven’t seen him, don’t miss him, you will really enjoy his show.